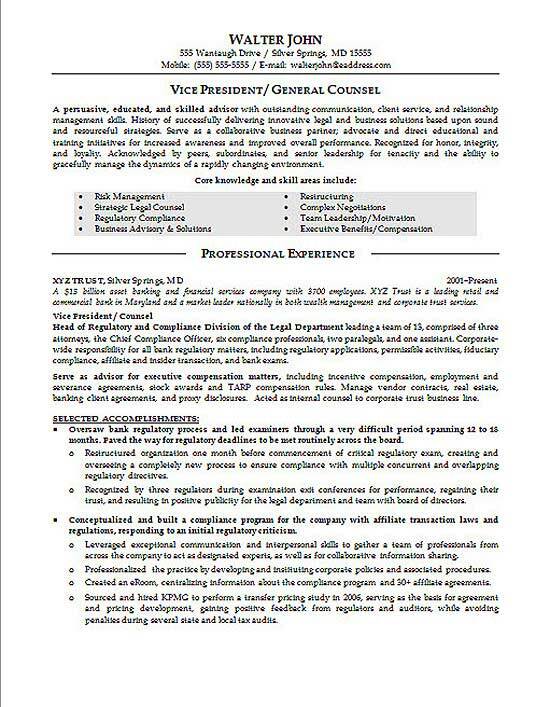 This resume is fora professional with experience as a Vice President of a trust company. This job seeker is a very experienced lawyer that has served as General Counsel for the company’s legal department. 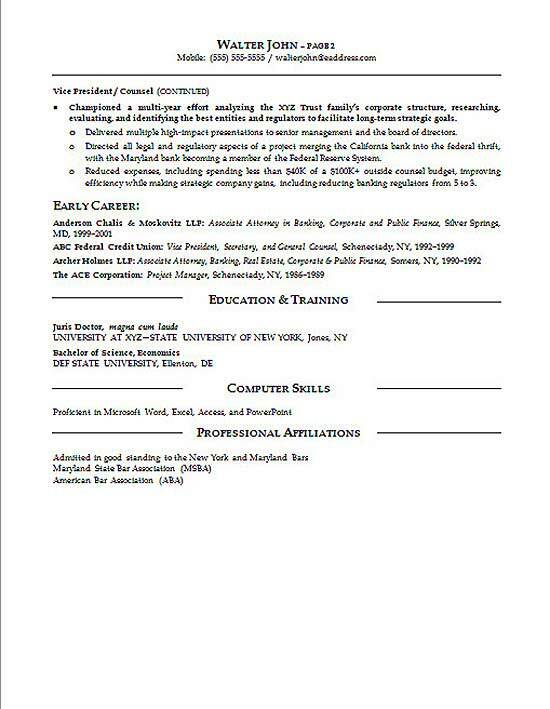 The resume begins with a job title headline to declare the job target. This is followed by an executive style summary paragraph that outlines their key strengths. A Core knowledge area is used to provide a quick glimpse of their career. This section highlights experience with risk management and regulatory compliance. The summary also touches on negotiations, business advisory and organizational restructuring. The job experience uses company, title and dates as the heading. The italic statements are used to define the size and scope of the company. The paragraphs document major responsibilities. The bullet points emphasize achievements such building a new compliance program. The education section lists the Juris Doctor and Bachelors of Science in Economics. Related computer skills and affiliations are found at the end of the document. Advise executive staff and Board of Directors on complicated legal matters. Oversee legal aspects of real estate procurement, business transactions, mergers, acquisitions and contracts. Serve as primary attorney for litigation and arbitration for commercial, financial, liability and employee relations cases. Manage litigation and arbitration for any suits brought onto the company, occasionally assisting trial attorneys. Direct entire legal department with full responsibility for internal lawyers and external attorneys that represent the company. Interpret laws, rules and regulations related to financial transactions and advise management on policy and procedural modifications. Evaluate potential trials and advise senior management on making settlements in major cases. Oversee efforts to proactively identify and mitigate legal exposure and litigation costs. Analyze court decisions and newly enacted state and federal regulation laws to determine impact and change requirements. Conduct legal research on matters associated with operations.